It is really tempting when getting set up to make a short chip to just set yourself over the ball comfortably, make a couple of practice swings to get the feel and then fire away. 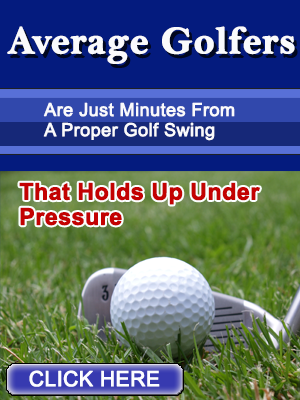 Golfers are missing out on consistency by not knowing or forgetting the building blocks of solid consistent contact. In this video, Brian gives those Tour Tactics to you. You might want to watch this video a couple of times and take notes and then work on your setup at home. It will pay off. Can’t get the sound to come on. Only take hands back a short distance when chipping, I try to keep them from getting more than an inch or 2 behind the ball. By stopping them short the momentum of the clubhead will create a natural wrist hinge (right palm down) that will cause the clubshaft to lean toward the target. Keep this wrist hinge all the way to the finish by moving hips, shoulders and arms in 1 piece motion back through the ball. You’ll hit the best little chips you ever saw. Dan,Keep most of your Weight (60%) on your left foot during the takeaway ,even when you come to the top of the backswing ,then when there ,push Off the inside sole of the right foot to fire the rotation into the downswing .This is the technique taught by PAUL WILSON of IGNITION GOLF and MARTIN CHUCK of REVOLUTION GOLF .It does work! Ok will give it a shot, thanks. Brian .Best tip I ever saw on fine chipping :you even mention (Which is seldom stated ) that the wrists should stay LOOSE in the release . NOSE ,SHIRT BUTTONS ,INSIDE LEFT KNEE all in Line = a successful CHIP . Middle OF stance is normal:for a higher flight ,move ball forwards :for a lower flight ,move ball backwards .